Very little stitching was done today as we went to watch "Rogue One", the latest Star Wars movie. 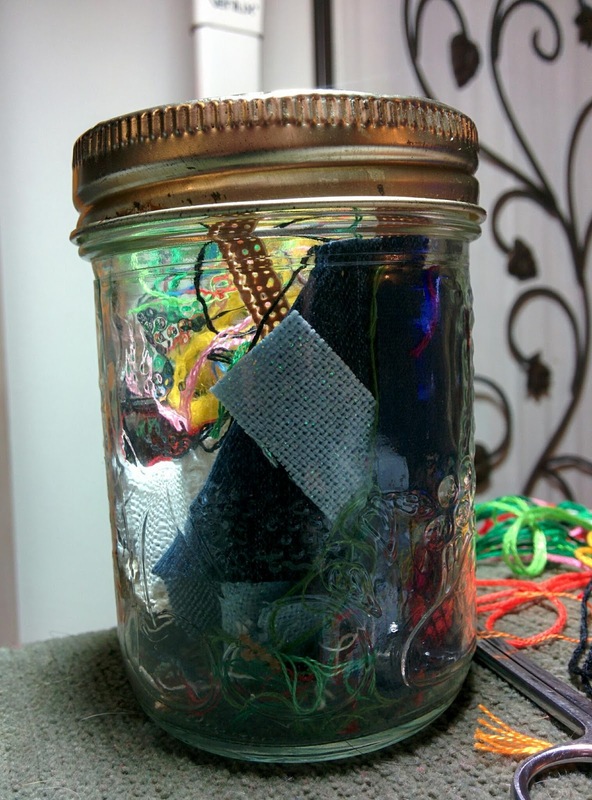 Instead, I present my ort jar for posterity and to ask what other people do with their scraps and bits while stitching. I like to keep my bits until either the current project is complete or the jar is full. Perhaps it is a sign of minor hoarding or a measure of accomplishment. I love emptying the jar and starting over. I also love to look over to see the colours and textures in the jar as it fills with the scraps. I have almost completed the stitching on the three cats piece and will post my progress on that tomorrow. The final finishing is still undecided despite my determination to see projects through to completion. Completion is something I struggle with which has resulted in a box of stitched pieces that need finishing. My not-resolution to completely finish some pieces this year!